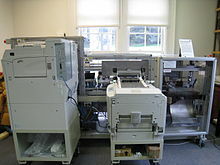 An on-demand book printer at the Internet Archive headquarters in San Francisco, California. Two large printers print the pages (left) and the cover (right) and feed them into the rest of the machine for collating and binding. Depending on the number of pages, printing may take 5 to 20 minutes. Print-on-demand (POD) is a printing technology and business process in which book copies (or other documents) are not printed until the company receives an order, allowing prints of singular or small quantities. While other industries established the build to order business model, "print-on-demand" could only develop after the beginning of digital printing, because it was not economical to print single copies using traditional printing technology such as letterpress and offset printing. Many traditional small presses have replaced their traditional printing equipment with POD equipment or contract their printing to POD service providers. Many academic publishers, including university presses, use POD services to maintain large backlists (lists of older publications); some use POD for all of their publications. Larger publishers may use POD in special circumstances, such as reprinting older, out of print titles or for test marketing. Before the introduction of digital printing technology, production of small numbers of publications had many limitations. Large print jobs were not a problem, but small numbers of printed pages were typically during the early 20th century produced using stencils and reproducing on a mimeograph or similar machine. These produced printed pages of inferior quality to a book, cheaply and reasonably fast. By about 1950, electrostatic copiers were available to make paper master plates for offset duplicating machines. From about 1960 copying onto plain paper became possible for photocopy machines to make multiple good-quality copies of a monochrome original. In 1966 Frederik Pohl discussed in Galaxy Science Fiction "a proposal for high-speed facsimile machines which would produce a book to your order, anywhere in the world". As the magazine's editor, he said that "it, or something like it, is surely the shape of the publishing business some time in the future". As technology advanced it became possible to store text in digital form—- paper tape, punched cards readable by digital computer, magnetic mass storage, etc.—- and to print on a teletypewriter, line printer or other computer printer, but the software and hardware to produce original good-quality printed colour text and graphics and to print small jobs fast and cheaply was unavailable. Print-on-demand with digital technology is a way to print items for a fixed cost per copy, regardless of the size of the order. While the unit price of each physical copy is greater than with offset printing, the average cost is lower for very small print jobs, because setup costs are much greater for offset printing. Many publishers use POD for other printing needs other than books such as galley proof, catalogs and review copies. These advantages reduce the risks associated with publishing books and prints and can result in increased choice for consumers. However, the reduced risks for the publisher can also mean that quality control is less rigorous than usual. King and McGaw art prints are made on-demand at their warehouse in Newhaven, England. Digital technology is ideally suited to publish small print jobs of posters (often as a single copy) when they are needed. The introduction of ultraviolet-curable inks and media for large format inkjet printers has allowed artists, photographers and owners of image collections to take advantage of print on-demand. For example, UK art retailer King and McGaw fulfils many of its art print orders by printing on-demand rather than pre-printing and storing them until they are sold, requiring less space and reducing overheads to the business. This was brought about after a fire destroyed £3 million worth of stock and damage to their warehouse. Other notable art retailers utilising POD include arthaus, Society6, TeePublic, and Redbubble. The introduction of POD technologies and business models has created a range of new book creation and publishing opportunities. There are three main categories of offerings. POD creates a new category of publishing (or printing) company that offers services, usually for a fee, directly to authors who wish to self-publish. These services generally include printing and shipping each individual book ordered, handling royalties, and getting listings in online bookstores. The initial investment required for POD services is less than for offset printing. Other services may also be available, including formatting, proofreading, and editing, but such companies typically do not spend money for marketing, unlike conventional publishers. Such companies are suitable for authors prepared to design and promote their work themselves, with minimal assistance and at minimal cost. POD publishing gives authors editorial independence, speed to market, ability to revise content, and greater financial return per copy than royalties paid by conventional publishers. While amateur/professional writers are targeted as early adopters by companies like Infinity Publishing and Trafford Publishing, there is an effort presently to make POD more mass-market. A class of companies like Lulu, Picaboo, Blurb, Peecho and QooP have chosen to be "author agnostic", attempting to serve a broad mass-market of ordinary citizens who may want to express, record and print keepsake copies of memories and personal writing (diaries, travelogues, wedding journals, baby books, family reunion reports etc.). Instead of tailoring themselves to the classic book format (100+ pages, mostly text, complex rules for copyright and royalties), these companies strive to make POD more mass-market by creating programs by which a range of different text and picture items can be produced as finished books. The management of copyrights and royalties is often less important for this market, as the books themselves have a small clientele (close family and friends, for instance). The major photo storage services (e.g. Eastman Kodak's Ofoto and Shutterfly and Hewlett-Packard's Snapfish) have included the ability to produce picture books and calendars. However, they emphasize digital photography. The companies Blurb and Lulu apply this method to a greater volume of creative work (primarily text, as typed in personal weblogs), and include the capability to embed photographs, and other media. QooP and Peecho assume the role of an infrastructure service provider, allowing any partner website to use its pre-designed payment and printing functions. The program Peecho provides an embeddable print button. Print-on-demand services that offer printing and distributing services to publishing companies (instead of directly to self-publishing authors) are also growing in popularity within the industry. Many major publishers print-on-demand as a way to save money. It can become costly to print a book regularly that is going to sit on a bookshelf for more than a year before being purchased. Print-on-demand allows texts to be revised and published rather more quickly. POD is environmentally friendly because there are only printing and shipping costs for actual sales. POD allows self publishers to get their books out for little start up costs. Among traditional publishers, POD services can be used to make sure that books remain available when one print job has sold out, but another has not yet become available. This maintains the availability of older titles the estimated future sales of which may not be great enough to justify a further conventional print job. This can be useful for publishers with large backlists, such that sales for individual titles may be few but cumulative sales may be significant. Print-on-demand can be used to reduce risk when dealing with "surge" titles that are expected to have large sales but a brief sales life (such as biographies of minor celebrities, or event tie-ins): these titles represent good profitability but also great risk owing to the danger of inadvertently printing many more copies than are necessary, and the associated costs of maintaining excess inventory or pulping. POD allows a publisher to use cheaper conventional printing to produce enough copies to satisfy a pessimistic forecast of the title's sales, and then rely on POD to make up the difference. POD offers advantages over conventional print production and distribution. POD service is not always easy to implement. Print providers and customers have to be willing to evaluate their business process with the flexibility and self determination to change what is necessary. Print-on-demand is also used to print and reprint "niche" books that may have a high retail price but limited sales opportunities, such as specialist academic works. An academic publisher may be expected to keep these specialist titles in print even though the target market is almost saturated, making further conventional print jobs uneconomic. The local history of a small community is well adapted to print-on-demand, as these books are invaluable to libraries, museums and archives in that small community but are limited in their marketability outside their home region. Public libraries which normally avoid print-on-demand tomes due to their lesser quality will readily make exceptions if content is appropriate for a local topic which cannot be addressed by more conventional means. Many of the smallest small presses, often known as micro-presses because they have inconsequential profits, have become reliant on POD technology and ebooks. This is either because they serve such a small market that print jobs would be unprofitable or because they are too small to absorb much financial risk. Print-on-demand also allows for books to be printed in a variety of formats. This process, known as accessible publishing, allows books to be printed in a variety of larger type sizes and special formats for those with vision impairment or reading disabilities, as well as personalised typefaces and formats that suit an individual reader's needs. This has been championed by a variety of new companies. Profits from print-on-demand publishing are on a per-sale basis, and royalties vary depending on the method by which the item is sold. Greatest profits are usually generated from sales direct from a print-on-demand service's website or by the author buying copies from the service at a discount, as the publisher, and then selling them personally. Lesser royalties come from traditional bookshops and online retailers both of which buy at high discount, although some POD companies allow the publisher or author to set their own discount level. Unless the publisher or author has fixed their discount rate, the greater the volume sold the less the royalty becomes, as the retailer is able to buy at greater discount. Because the per-unit cost is typically greater with POD than with a print job of thousands of copies, it is common for POD books to be more expensive than similar books made by conventional print jobs, especially if a book is produced exclusively with POD instead of using POD as a supplemental technology between print jobs. Book stores order books through a wholesaler or distributor, usually at high discount of as much as 70 percent. Wholesalers obtain their books in two ways: either as a special order such that the book is ordered direct from a publisher when a book store requests a copy, or as a stocked title which they keep in their own warehouse as part of their inventory. Stocked titles are usually also available via sale or return, meaning that the book store can return unsold stock for full credit as much as one year after the initial sale. POD books are rarely if ever available on such terms because for the publishing provider it is considered too much of a risk. However, wholesalers monitor what titles they are selling, and if authors promote their work successfully and achieve a reasonable number of orders from book stores or online retailers (who use the same wholesalers as the stores), then there is a reasonable chance of their work becoming available on such terms. Although returnability lessens the risk for book stores, only a certain proportion of such stock can be returned. Non-returnability can make bookstores less enthusiastic about POD books. Many print-on-demand titles are debut works; many bookstores are reluctant to risk an author's first, untested work without the endorsement of a commercial publisher. Another issue is that these books are not available right away and take time to create (Friedlander). When a customer wants to purchase one of these books they are less likely to follow through with the sale because they do not get the book that day. They are more likely to go home and order through another company like Amazon. Wikimedia Commons has media related to Print on demand. ^ Scott Jaschik (31 July 2007). "New Model for University Presses" (electronic). insidehighered.com. Archived from the original on 12 August 2007. Retrieved 14 August 2007. ^ Snow, Danny (February 2001). "Print-on-Demand: The Best Bridge Between New Technologies and Established Markets". BookTech: The Magazine for Publishers. ^ a b "Copying Machines". Archived from the original on 4 October 2013. ^ Pohl, Frederik (April 1966). "Where the Jobs Go". Editorial. Galaxy Science Fiction. pp. 4–6. ^ "About at King & McGaw". Archived from the original on 23 September 2015. ^ "How I Made It: Gyr King, founder of King & McGaw - The Sunday Times". Archived from the original on 29 May 2015. ^ Garner, Dwight (20 May 2008). "Making Reading Easier". The New York Times. Archived from the original on 25 August 2010. Retrieved 22 May 2010.